CALGARY, AB – Village Brewery has announced details of the 2nd annual edition of Village Friend, a series of collaborative beers brewed to support the growth of small craft breweries in Calgary. 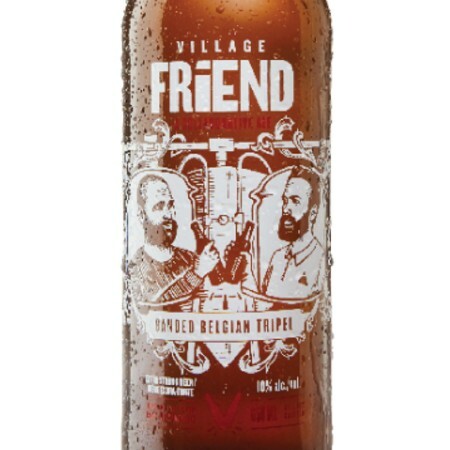 This year’s Village Friend is a big and delicious Belgian Tripel coming in at 10% alc./vol. Made with Pilsner, Red Shed Biscuit and Vienna malts, Galena, Tettnang and Hallertau hops as well as an addition of Belgian candi sugar. All led by a beautiful 36 IBUs. Village Friend 2017 will be released tomorrow (February 1st) at the Village Brewery during an open event from 2:00 to 5:00 PM that will also feature the launch of a two month photo exhibition as part of the Exposure Photography Festival, and the tapping of a cask of spruce ale created with the Tree Tossers, a local group who collected 600 Christmas trees and funds for charity during the month of January. Following tomorrow’s debut, Village Friend will be available at the Village retail store, and select liquor stores in Alberta. All proceeds from the beer will be given to Beanded Peak to go towards the purchase of brewery lab equipment.